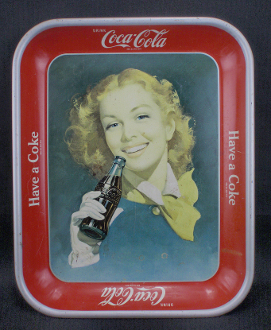 Vintage Original 1948 Coca Cola Serving Tray - The smiling red haired girl with the wind in her face sipping on a Coca Cola. Measures 13 1/4" x 10 1/2" x 1 1/8". Tray shows wear, stains, scratches, rust and faded colors. Good honest wear from use typical of a tray this old. Displays nicely.